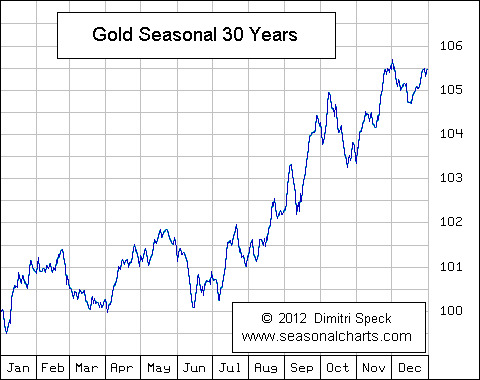 This chart courtesy www.seasonalcharts.com shows the historical trend of the price of gold, based on 30 years of data. Once the doldrums of June and July are out of the way, price usually rises until January-February. The challenge is to catch the June lows. 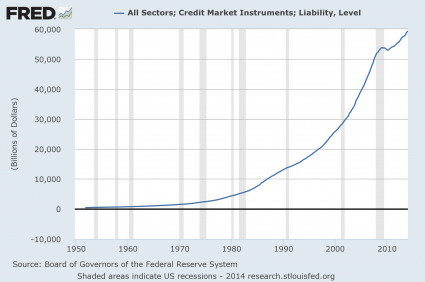 This chart courtesy Federal Reserve Bank of St. Louis shows the total amount of debt in the USA is now 60 trillion dollars. This cannot possibly be paid off, and it will be inflated away. Gold and silver will benefit. "Gold, unlike all other commodities, is a currency...and the major thrust in the demand for gold is not for jewelry. It’s not for anything other than an escape from what is perceived to be a fiat money system, paper money that seems to be deteriorating." 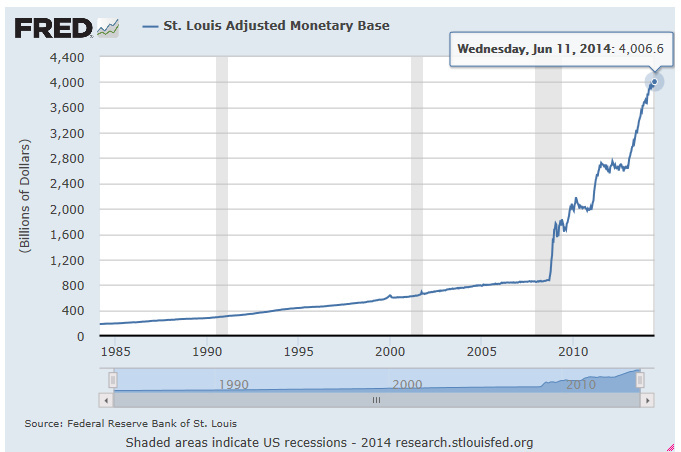 This chart is also courtesy Federal Reserve Bank of St. Louis. The chart shows the Base having just topped the 4 trillion dollar level, and it does not reflect any ‘tapering’! Instead it shows the US Monetary Base has increased from 800 billion dollars to over 4 trillion dollars in just 5 years. This new money has inflated the bond market and the stock market, and soon a lot of this money will find its way into the precious metals sector, as price inflation motivates investors to seek protection from ‘asset destruction’. "It is a sobering fact that the prominence of central banks in this century has coincided with a general tendency towards more inflation, not less. [I]f the overriding objective is price stability, we did better with the nineteenth-century gold standard and passive central banks, with currency boards, or even with ‘free banking.’ The truly unique power of a central bank, after all, is the power to create money, and ultimately the power to create is the power to destroy." 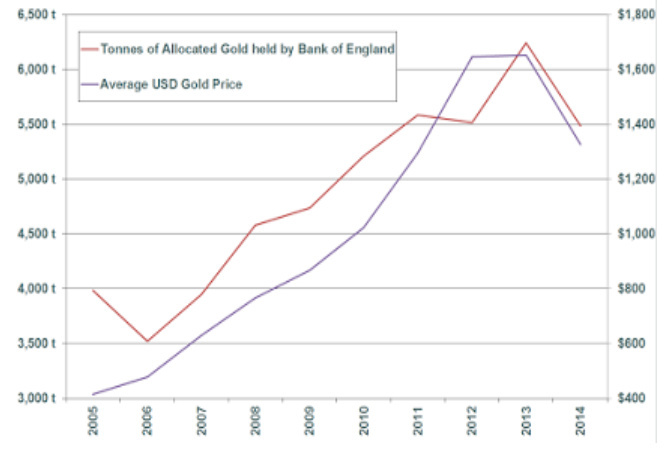 This chart courtesy www.Ingoldwetrust.ch shows custodial gold stored at the Bank of England fell by 755 tonnes in 2013. This proves the demand for physical gold is greater than mine supply can meet. 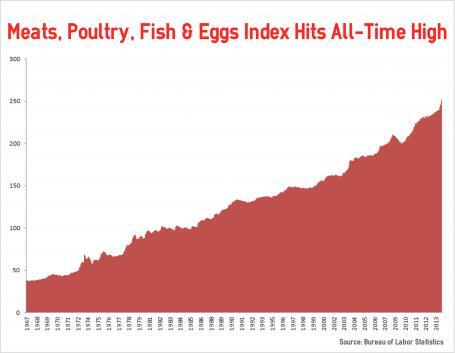 This chart courtesy BLS and CNSNews.com shows the food index at BLS has just reached a new all-time high at 252.8. The index rose 7.7% during the past 12 months. "Gold still represents the ultimate form of payment in the world. Fiat money in extremis is accepted by nobody. Gold is always accepted." This chart courtesy Stockcharts.com features PHYS the Sprott gold trust. Price is breaking out at the moving averages. A close above the green arrow will turn the trend bullish. The 3 supporting indicators are positive. 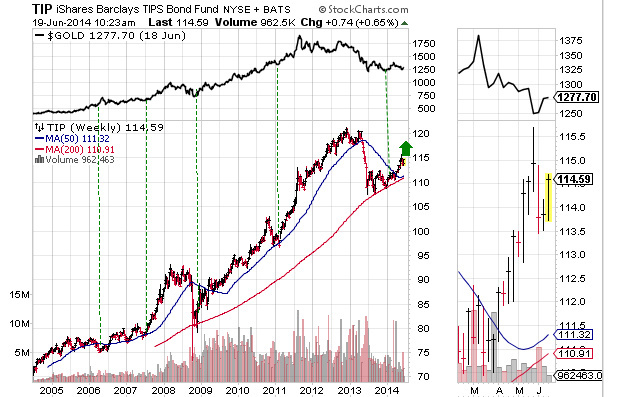 This chart courtesy Stockcharts.com shows TIP the bond fund that is indexed to inflation. Investors in TIP seem to know when price inflation is on the horizon. Historically, whenever TIP breaks out after a pullback (as now), the price of gold (top of chart) begins to rise! Once again TIP is setting the example for gold to follow. "Governments lie; bankers lie; even auditors sometimes lie: gold tells the truth." 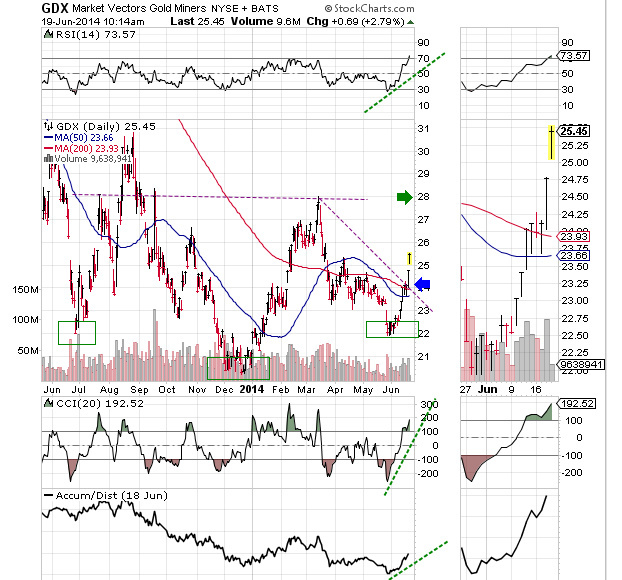 This chart courtesy Stockcharts.com shows GDX the gold and silver producers ETF has broken out at the downtrend lines. The supporting indicators are positive, including the important A/D line. We await the breakout at the green arrow. This will confirm an ‘inverted head and shoulders’ pattern, with a target at 36! This chart courtesy Stockcharts.com shows the US dollar ETF is dropping below the most recent support line. The supporting indicators are negative. Almost always, the US dollar index moves in the opposite direction to gold and silver. 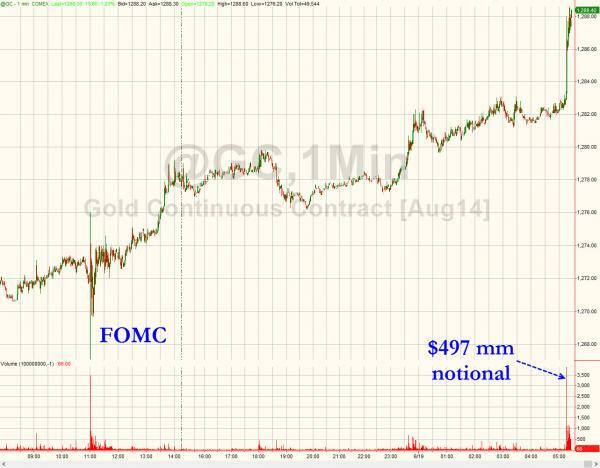 "Like gold, U.S. dollars have value only to the extent that they are strictly limited in supply. But the U.S. government has a technology, called a printing press (or, today, its electronic equivalent), that allows it to produce as many U.S. dollars as it wishes at essentially no cost. By increasing the number of U.S. dollars in circulation, or even by credibly threatening to do so, the U.S. government can also reduce the value of a dollar in terms of goods and services, which is equivalent to raising the prices in dollars of those goods and services." -- Ben Bernanke, the former Chairman of the Board of Governors of the Federal Reserve Bank of the United States, in a speech he made on November 21, 2002 before the National Economists Club in Washington, D.C. This chart courtesy www.goldmoney.com shows 'managed money' (mostly hedge funds), is short the largest number of contracts since at least 2006. 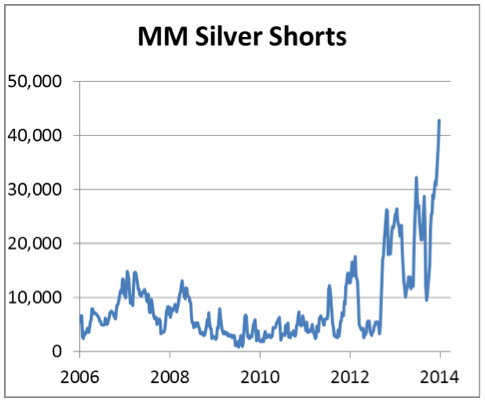 These positions have to be covered, when the price of silver begins to rise. From a contrarian perspective this is a very bullish chart. Featured is PSLV the Sprott silver trust. Price is breaking out at the bullish falling wedge pattern. A close above the green arrow will turn the trend bullish. The 3 supporting indicators are positive. The premium over bullion is a positive +2.0%. Our thanks to www.nowandfutures.com for the quotes used in this article.